During my high school years my parents were missionaries in South America, so shortwave radio was my lifeline to keep up with news and sports from the U.S. The impact of radio in my life drove me to pursue it as a career. I graduated from Otterbein College (OH) in 1991 with a BA in Speech Communication, and started working that summer at WMVO/WQIO in Mount Vernon as Sports Director. Our stations changed ownership twice and eventually became part of Clear Channel’s 10-station cluster in North Central Ohio in 2001. I was PD for our Soft AC station, did afternoons and was also General Manager for the four stations housed in Mount Vernon. The door opened for me to join MVNU full-time in 2005 to teach in the communication department and oversee the broadcasting program. I also finished a Master’s Degree in Communication from Spring Arbor University. I also do afternoons on WNZR. 1. How has WNZR evolved over the last few years? 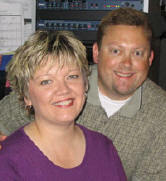 My wife Marcy is Station Manager, MVNU alum, and has been at WNZR since 1996. She and I work truly as a team- I handle the academic side and she handles the day-to-day operational side. We’ve seen consistent growth in listenership and listener support. When Marcy came back in ‘96, the station was raising about $3,000 annually through sharathon. This year, we’re over $65,000. In the last 12-18 months, we’ve made it a priority at the station to re-define our mission and vision, and make sure everything we do revolves around it. The key part of the mission statement is to glorify God – making sure we are using this amazing tool He has provided for His glory. That fuels excellence on the air, building relationships with our listeners, and helping our students learn and grow in their skills and their service. Our university vision statement is to “change the world with the love of Christ,” and WNZR wants to be at the forefront of making that happen. Two station “dreams” are also becoming reality…the first was getting a remote vehicle, which we did this spring and debuted this summer. The second was a power increase and that was approved last summer by the FCC. We are in the construction phase right now and hope to finish very soon. This will increase our signal strength from around 130 watts to nearly 1300. On the grand scale of things, that may seem small to others, but it’s a big deal to our listeners, especially the ones on the fringe of our coverage area! 2. Has WNZR made any changes due to the economic situation, been affected in any way? Absolutely. Student-wise, we have to be more pro-active in recruiting because going to school closer to home, or going to community college for the first two years has become a practical financial option for many of our potential students. That’s a challenge because ideally we want students in our program 3-4 years so they are ready for the marketplace when they graduate. Station-wise, we’ve had to become more reliant on fundraising and underwriting because the university budget to our program has tightened…but the economy has obviously impacted the amount listeners and underwriters can give. With the vehicle and power boost projects on the horizon, the timing hasn’t been perfect, but it’s just another reminder that we need to lean on God and NOT on our own understanding. Our listeners have been faithful and continue to amaze us each day with their generosity and belief in what we’re doing. We’re in a small college town in North Central Ohio (MVNU and Kenyon are both here)…about 20,000 in the city (Mount Vernon) and around 50,000 in the county (Knox). But we’re nestled ideally between Columbus and Mansfield, and we fill the gap between the great stations there. Our signal boost is going to help us fill even more of that gap. We also get a lot of chances to train our students in community events, because in small towns, you get plenty of them. The promotions that work best connect directly to the listener and her life. We want to give away experiences rather than just prizes. The ideal promotions link your listeners and community and build goodwill with both. Something we’ve done for over 10 years now, is team up with MVNU and a local construction company to purchase hogs at our county fair’s junior fair sale. We handle the processing then give away the meat (bacon, ribs, chops) as the grand prize the last day our fair coverage. We are supporting our local kids, families win a freezer full of meat, and it’s a win-win for everyone. It’s not so much about the prize; it’s how we frame it on the air. Think of your prize basket not simply as CD’s and ice cream certificates, but instead as a chance to have a night out with your family to connect and create a memory. Provide stations with more audio versions of “the story behind the song.” A few artists/labels are starting to put these up on PlayMPE…it helps radio connect new songs to a listener and I think it is a great marketing tool that is underused. The story doesn’t have to be extremely deep and spiritual, either- just the artist sharing their inspiration. Please remember that the small markets (and I mean non-rated ones, like ours) have listeners, they buy/download songs, go to concerts, and like to find out about new artists. This means small market access to new singles is critical. Small non-reporters tend to get “purged” out of the PlayMPE system, and it is a hassle to get back in. Oh, and when we call…please call back or e-mail. Quite frankly, our biggest obstacle will always be the enemy. He will try all he can to throw us off of our collective mission to reach lost souls for Christ. We must be disciplined in praying for our station, staff and listeners every day. Border your station in prayer. If you’re the GM, be the spiritual leader of your station or bring in a community pastor to serve in that role. In a practical radio sense, it’s the same story it has been for the last decade or so…trying to expand our footprint by embracing new technology. That takes awareness, planning, and in most cases a willingness to take on the financial commitment that comes with it. As we move closer and closer to the ultimate convergent “do-it-all” handheld wireless device, we need to make sure our stations have a presence there, and that those who want our content can access it. It begins on the inside. The first thing they have to do is leave their ego at the door and embrace the mission of their radio station. If they can’t do that, they’re in the wrong place. Ken Blanchard and Phil Hodges nailed this in Lead Like Jesus when they wrote about the two acronyms of EGO. The first is Edging God Out…the second is Exalting God Only. We need more of the latter. Once they are able to do that they can blossom to be that companion and trusted friend to the listener. 9. What (if any) Christian radio stations do you consider as innovators today. The innovative stations are the ones bold enough to follow the direction God calls them to instead of what everyone else tells them to do. My prayer is that Christian radio continues to serve as an extension of the church- a community of love, worship and evangelism. Christian radio should be distinctive from anything else heard on the airwaves because we have a great story to tell! I fully anticipate there will be temptation for us to water down our message, but if we can ignore that and continue use music and teaching to effectively tell the story of hope, redemption and beauty that defines our faith, we will make a difference in the areas where we broadcast. Thanks to a recent Focus on the Family broadcast, I found out about and am currently reading Chuck Colson’s book The Faith, which has helped me realize the importance of reaffirming what we believe, why we believe it and why it matters (the companion DVD with Chuck and Gabe Lyons is also excellent). Christian radio will remain strong if we remember to walk in the confidence that our God is real and relevant, and as leaders of radio stations nurture and encourage the spiritual development of our staff.